This entry was posted in 1900's, 40'>42', Designers & Builders, Launches, Non Waitemata, Tales & Yarns and tagged Bruce Askew, Logan Bros., Matareka 1, Maxie by Alan Houghton - waitematawoodys.com founder. Bookmark the permalink. Conrad Robertson of Robertson Boatbuilders has a suitable mold that would allow you to achieve the desired result a great deal quicker, however if its electric propulsion you require – I hope the daily runs are short or the budget is vast as it will need to be one or the other. Greg Noble, your concept has been done here where I live in Sth.East Qld. The boat concerned was built around 1900 and used to tow log rafts and later, log barges before becoming a fishing boat. The owner built an outside skeleton then stripped the inside, all ribs framing and such then used the hull as a female mould and layered up a f.g. skin. He retained the original backbone, stem-keel deadwood and stern post.The power unit is a 110 hp. Iveco Fiat with 2:1 red. She is ready to go in the water now but the owner has health issues and probably won’t finish her.I will send pics to Alan and he may send them on to you along with my mail addy if you want more info. Ignoring the confusion – both are exceptionally pretty! I got that very wrong, but in defence I was sent both sets of photos in the same email & was doing the WW story from my iPhone. Have deleted the photos of Mavis & any reference to her. In that case this isn’t the Logan built Mavis in the later photos. That’s Mavis as built by Ernie Lane in Picton in 1919. Mavis is still alive and very well and living in Havelock. Agree with Chris – two different boats. The first few pics are of MAXIE (Logan 1903) – torpedo stern. The hand written caption says MAXIE in one of the pics. She now has a berth alongside ROMANCE at Taupo Boat Harbour. MAVIS has a transom as can be seen in one of the pics. So are we talking MAXIE or MAVIS when it comes to the proposed new boat? Very interesting to see a pic of MAXIE as built, or at least as she was in 1926, as a 23 year old. Have we got two different boats in the photos here? 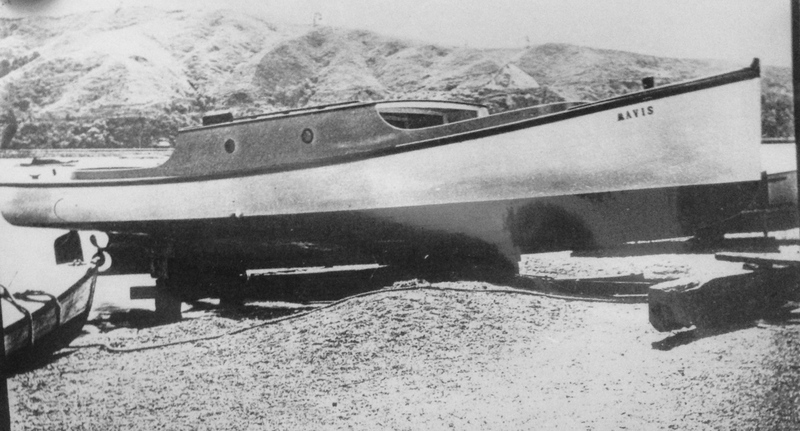 One being the Logan built Mavis (looking like having a cruiser stern) and the other being the E R Lane of Picton built Mavis with the low cabin top and a flat transom.